"Oh, s***!!! She's almost as big as me.......what am I gonna do THEN?" 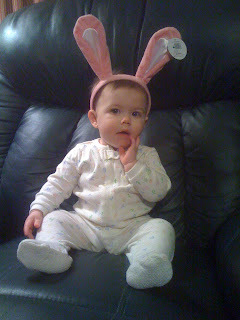 As adorable as she looks in the bunny ears, she can have ANYTHING she wants from Grammy!!! 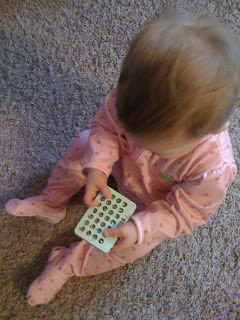 (except what's in that little package in her hands in pic #2!) 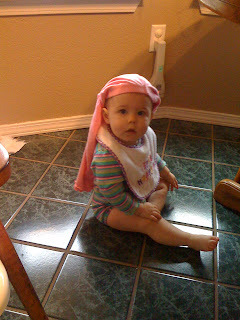 She even looks cute with her pants on her head (and doesn't seem to mind them being up there). 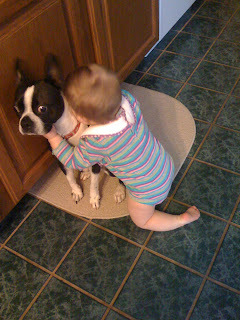 And poor Fergie says, "I said 'CUSE me, not SQUEEZE me! "....she does tend to burp and toot quite often and I'm sure you have taught her some manners by now. Good job Lee.....keep them coming! "Get along little doggie"!. She's thinking I hope she doesn't climb aboard! Love the pics. I have the picture of Becca w/rabbit ears framed and on my end table. Lee sent it to Julie, Julie sent it to me and I sent it to my bosses computer and he has a printer and printed it out and framed it. It turned out great! Uncle T and I don't exactly know what Fergie is thinking but feel as if she is stuck between a Bramell and a hard spot. 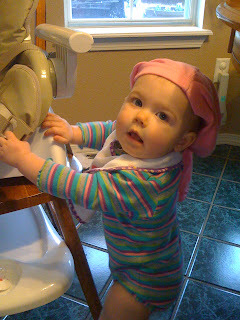 As for Pic #1 with the ears...Becca said, "I don't know what this is on my head, but I sure can hear better." Can't wait to see ya'll. Keep the pics coming. WE LOVE THEM!!! Fergie said..."Why does she get to climb on me? They won't let me climb on her. NO FAIR!"